Yes, we post this almost every year at this time, but you can never get too much of a good thing. Have a fun and safe Halloween! 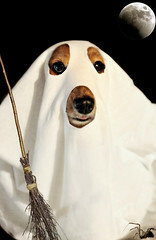 Those Special Dachshunds Halloween Edition: Meet Bambi! Hello handsome Joey and beautiful Maggie! I am a daily offender of The Long and Short of it All! 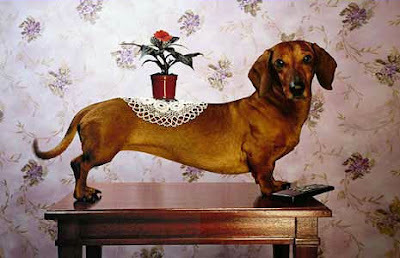 I just can't get enough doxie love and your blog basically combines all of my favorite things! 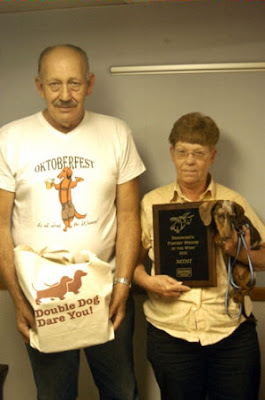 I love to hear about doxies around the world doing incredible things, vintage dachshund photos and Wiener race coverage! My doxies and I are so so so happy to hear Joey is doing better! We wish you and your lovely companions all the the best this Halloween! 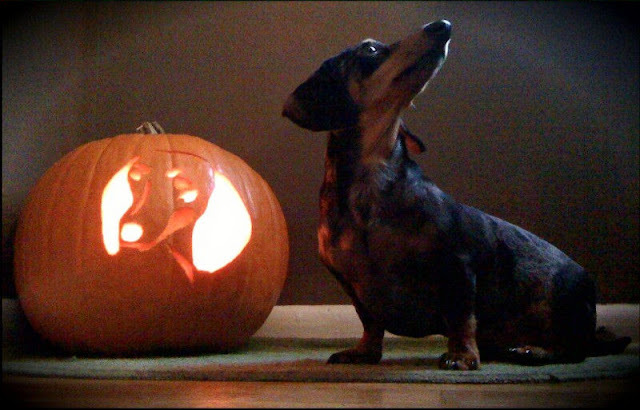 P.S Sending you a photo of my Bambi last Halloween with our doxie pumpkin, isn't she precious! She sure is. Thanks for sending in the great photo! Spooky! Hoping everyone has a great Halloween! You know, it's been a solid 2 or 3 years since I've had a white-tipped tail?! There wasn't a single white hair left. Dad figured that with my age (I'm almost 10! ), and Dachshund pattern baldness, it was gone for good. He joked the last several years that I'm so lazy that I can't even grow hair. Hhmmpf. Guess I showed him today when he was blinded (and excited!) by the whirr of my white-tipped tail in the autumn sun. Who knows how or why it grew back, maybe the removal of my adrenal glands, as Cushing's disease does cause baldness, but I haven't had Cushing's for 3 years. Or maybe it's one of the medications I'm on, but all I know is I'm back baby, I'm whole, I'm Joey, and I'm PIEBALD. It's a great day. August 12, 1937, For Immediate Release: PORTRAIT OF A LADY: On the left is the original and on the right the modernistic portrait by Edward Biberman which recently caused great controversy in Hollywood. It pictures Joan Crawford as an Egyptian goddess, which is the way the artist said he saw her. The portrait hangs in the drawing room of the star's home, where this picture, with her two prized Dachshunds, Baby and Boopshen, were taken. Under contract to Metro-Goldwyn-Mayer, her next picture is soon to be announced. Photo source: press release scanned from Joey and Maggie's personal collection; photo by legend George Hurrell. Makes you rethink all those Dachshund collectibles you've got around the house. What appears to be a dapple black and tan or chocolate longhair confounded commuters and local authorities yesterday morning in Schalksmühle, Germany. 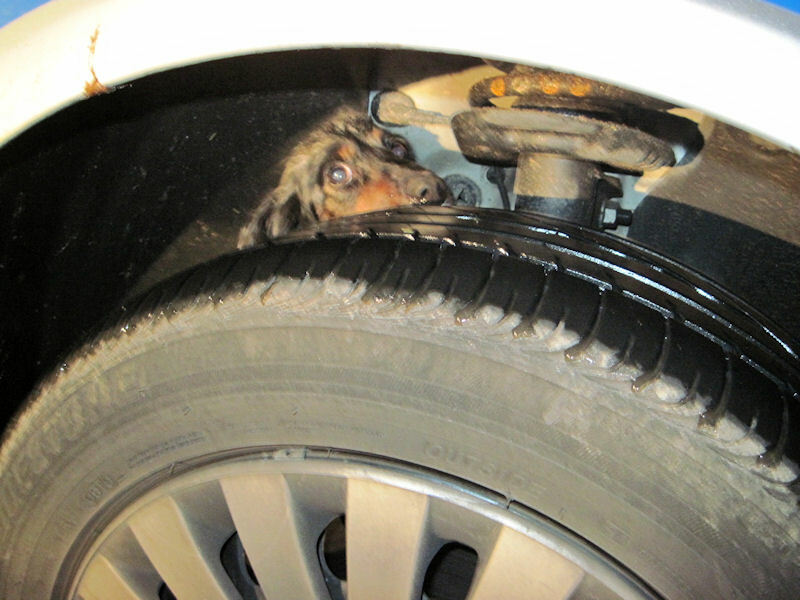 A driver was waiting at a railroad crossing at 6:40 in the morning when the Dachshund dashed under his car and refused to come out. All attempts to get the frightened dog out from under the car failed, as he snapped and snarled at his helpers. The police were called in, who also failed at getting him out - until he changed his mind and ran under the police car instead, taking residence in the wheel well, as seen above. Animal Control was finally called in, who were able to place him in a crate thanks to the thick gloves they were wearing. All told, the little "terrorist" held up traffic for nearly two hours. He is now waiting for his humans to pick him up at a local shelter. Source. We couldn't make this stuff up if we tried. 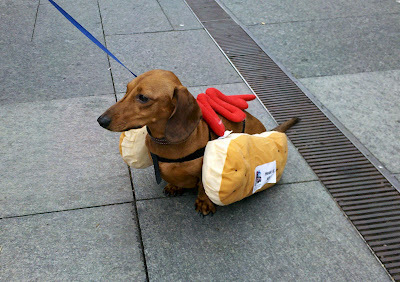 Don't get us wrong - we LOVE Dachtober, but the Halloween costumes - not so much. Frito, seen here in a video by doxzens4ever, isn't so happy either. We can only imagine what our Dad has in store for us. How 'bout you guys? He came to me as a patient in 2003. He was just a couple months old. The vet brought him in – he had been injured either by being dropped or stood on. The result was a spinal cord injury. He was paralyzed from the mid-back down and could not go to the bathroom by himself so he was probably on his way to being euthanized. Well, we fell in love with him. I adjusted him and got some sensation back in his tail which he ended up chewing and the vet had to dock.it. But after a slew of adjustments, acupuncture, hydrotherapy we did not get the movement back in his legs but we did get him a little wheelchair. Read more about Waldo at the B-Town Blog. You may need a Scottish interpreter for this piece, but enjoy comedian Billy Connolly as he talks about Dachshunds at London's Royal Albert Hall in1987. Newly uploaded video by youtuber 8eios7. 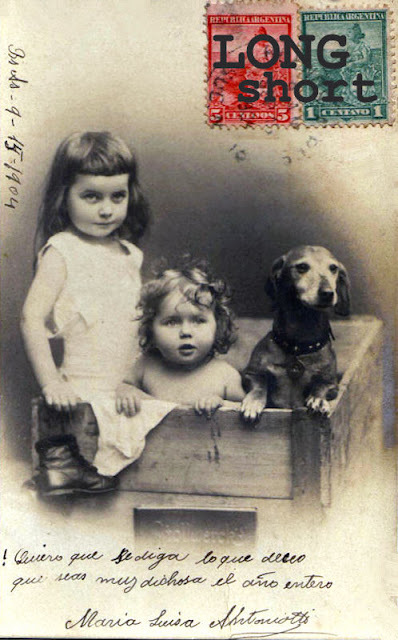 Two children and a beautiful red senior Dachshund in a box - circa 1904. Thanks to our Maryland pals Kate 'n Allie for sending in the link to Naked Décor's Hot Dog clock, but we'll be darned if we didn't already feature it and their Dachshund pillows in the past. 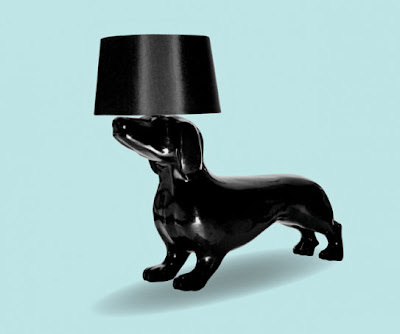 Third time's a charm as they say though, and we see that the fun Naked Décor website has been updated with lots of new Dachshund and dog merchandise just in time for the holidays. Above, Happy Stripes Hot Dog Pillow in White is hand silkscreened and will run you about $49.95 with free shipping in the US. The Happy Hot Dog Table Lamp is made of hand-finished fiberglass and will set you back $350, again with free shipping in the US. Find your style at Naked Décor. Kicking off your week with a heaping tablespoon of cute, it's 'Beanie' giving birth to four puppies by vimeoer Travis Long, staff photojournalist for the News & Observer in Raleigh, NC. On Sunday morning, Yeas & Nays spotted former Secretary of Defense Donald Rumsfeld and his wife Joyce at the Jack Russell Terrier Races & Dachshund Dash in St. Michaels, Md. Rumsfeld, who has two dogs of his own, told us he's lived in St. Michaels for three years and loves it there. 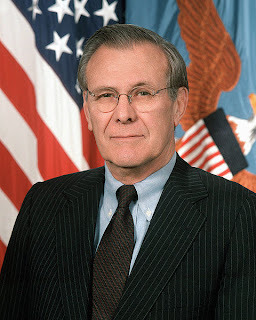 As of 2007, Mr. and Mrs. Rumsfeld's Wiener Dogs were 'Reggie' and 'Chester.' Hope they had a great time. It's hard to write of the passing of Dachshunds here, and even harder when you know them personally. So, with tears streaming down our face, we report the passing of our dear friend, incredibly handsome red smooth 'Clancy,' who left this planet on Wednesday, October 20th, 2010. He had just had his 11th birthday, and his passing was quite unexpected. Words can't express our sorrow, and words can't express the love and admiration we have for him, and his humans - true friends and Dachshundists to the core. Clancy was a "special needs" dog - a breeder boy who had gone blind - and his humans found it in their hearts to adopt him and give him the best life he could possibly have. And while his blindness may have hampered him in some situations, his lovable Dachshund personality would always shine through and quickly bring a smile to your face. 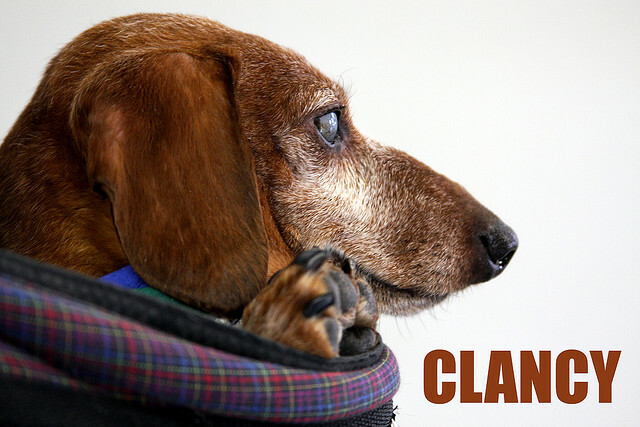 Clancy and his humans have been big supporters of this site for many years now - a cursory look details submission after submission from our pal Clancy. And if you don't know his humans, you know his Dad's work - he writes most of the fine monthly columns at Dachshund Delights - which most recently included a beautiful poem about your 'Long and Short of it All' host 'Joey.' And you've no doubt read his Dad's work in other places around the net and you didn't even know it - surely you've read Poe's First Draft of 'The Raven'? We took the above photo of Clancy at a local Dachshund meetup here in Chicago. His dad would always carry him in the blue checked knapsack because that is where Clancy felt comfortable. We will sure miss you, little guy. You were so loved. Meet Michael Künzel and his sweet nearly 16-year-old red longhair 'Dalia,' who hail from Mönchengladbach, Germany. They are in a bit of a bind with local authorities after Dalia's vet has stated that the deaf girl should not be using a leash due to her IVDD issues - any sort of strain could lead to acute paralysis. And even though Herr Künzel has a written certificate from his vet which explains the issue, he has racked up 700 € in fines, nearly 1,000 US Dollars for walking Dalia untethered. After going to court twice to fight the fines, Künzel must pay in full or go to prison. "There are no exceptions to this law," the city has stated. Read more (you may need to translate the link) at RP Online. 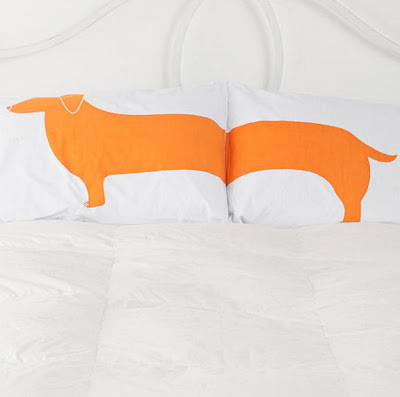 Wouldn't these Dachshund pillowcases brighten up the boudoir for the Dachtober season? Via Apartment Therapy, available exclusively at Urban Outfitters, $28. Thanks so much to 'Charlie' Watson and his human Jessica for sending in the link! Looks like Charlie sure enjoys his pillow time. Don't forget to take your Dachshund when you go to the pumpkin patch this year! Video by youtuber SaneOneTV. 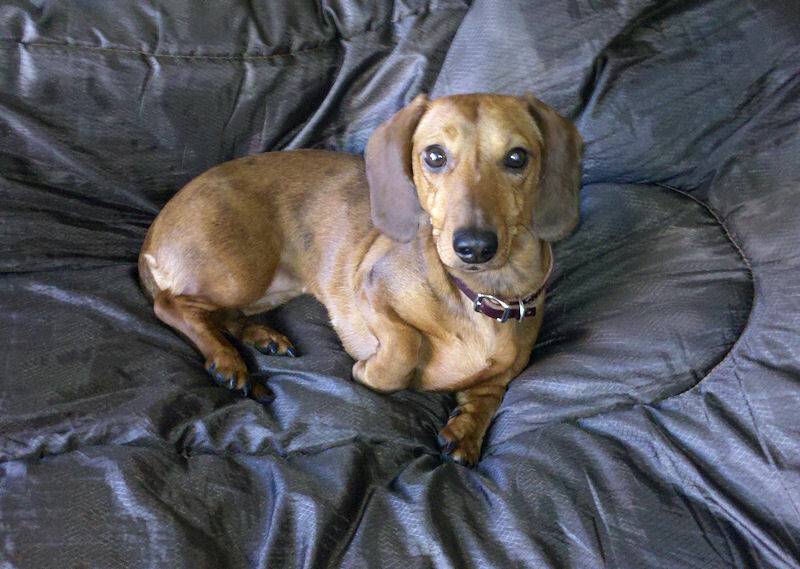 Seems like there has been a lot of bad Dachshund news lately so I felt compelled to share the tale of my brown-eyed girl, something upbeat and positive. I've only had my little girl for about a year and half but here is her story so far. The tale begins in May of 2009 when I was going through a divorce. 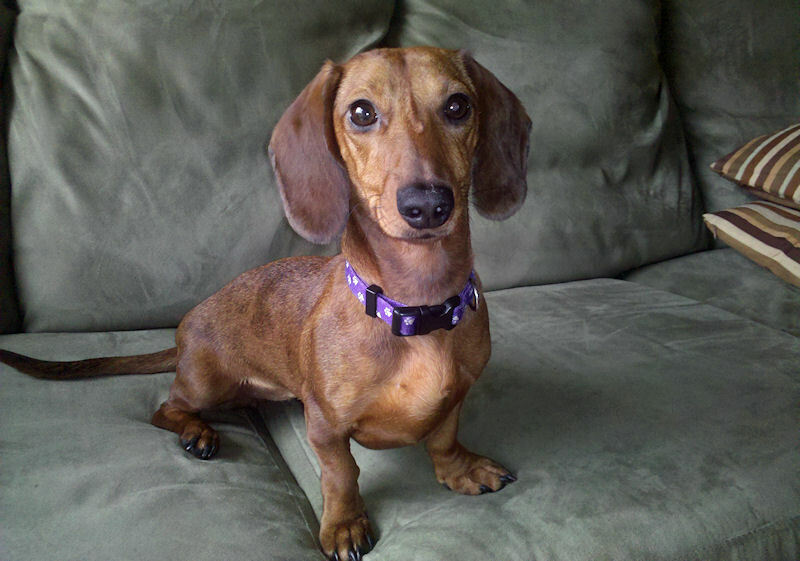 Two years prior I had bought a black and tan Dachshund, that we named Oscar, for my wife. Although he had been a gift for her he quickly became my dog. In a very tricky maneuver during the split-up phase she wound up taking Oscar with her. Feeling my best course of action at the time was to remain calm and let the court sort it out, I did just that. They determined that since he had been a gift he would stay with her, treating him like a piece of property, and I was devastated. My grief immediately changed from missing my wife and wondering where our marriage went wrong to missing my dog. 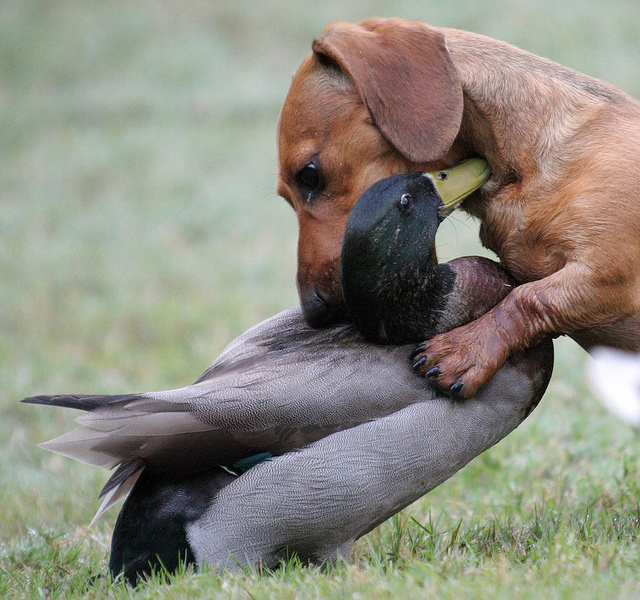 It was then I realized I was a Dachshundist, as you put it. I had to fill a void in my life that could only be filled by the perfect addition to any family, a Dachshund. 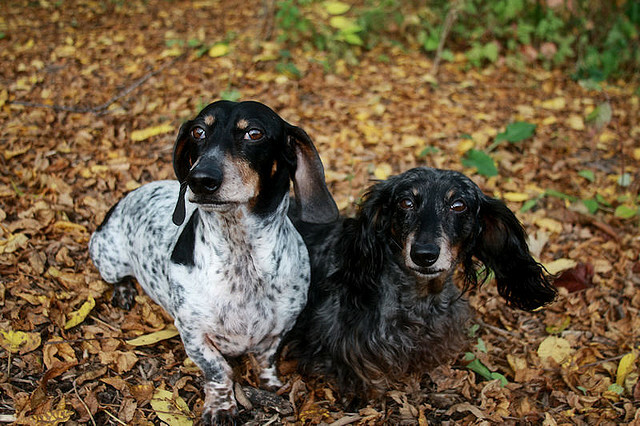 I had decided I wanted to rescue and that, if possible, I'd like either a red or dapple short hair. Hard to believe as it may be, during that timeframe, I wasn't able to locate a Dachshund at any of the rescues within a 4 hour drive from where I live. I was crushed. A good friend recommended I take a look out on craigslist, so I did. I went into the pets section for Cincinnati and within the first 4 or 5 posts saw something that made me feel the best I had in a long long time. Someone had a short hair red dapple mix only about 30 minutes from home. I called to ask about her and they said her rehoming fee was $150 and that one other person was interested in her -- a breeder. They didn't want her to go to a breeder, but badly needed the money and pretty much told me to get there first and it wouldn't be an issue. I leapt from my desk and told my boss I had something important I had to go do and left immediately to get my girl and save her from the breeder. They weren't too pleased with her going through her chewing phase. haha I can relate. A dining room suit, a coffee table, a TV stand, a camcorder I really liked, and a few pieces of wood trim down the line, I finally got her out of that stage. She was pretty darn expensive there for awhile but I think she's worth it. Patience, patience, patience, right? In the end she is well aware of the rules and I don't even have to crate her now. That particularly made me happy so she can play and run while I'm at work. I simply had no choice but to crate her for awhile and I felt guilty every single day. I walked into their home to see her for the first time and she was such a sweet girl. She ran over to meet this new guy and give him plenty of puppy kisses. It was love at first sight, mutually of course. Her birth date is January 1st, 2009 and she moved into her forever home on June 17th, 2009. Now she's my spoiled little brown eyed girl and we do everything together. She loves going for rides in the car, meeting and playing with other dogs at the dog park, taking long walks in the woods, rolling in the grass, her every Friday new toy play-a-thon, her every other Saturday trip to the puppy salon, and Dachshund events (that aren't taking place while I'm at work... ARGH!). She participated in the Running of the Wieners this year and had never seen so many Dachshunds in one place and was just beside herself. She's an extremely sweet girl that's always happy when friends stop by to visit her. Also, everything that's mine is hers. haha I recently got a new desk chair that, before I had sat in it for the first time, she had laid claim to. She also loves her sleeping bag when daddy is at work. One odd thing about her... she thinks the vacuum is a game, which is pretty entertaining. She also thinks the blow dryer at the puppy salon is the same game, so they just towel dry her. haha She refuses to have her scarf from the salon taken off any sooner than three days after her visit. She loves getting her Greenie's every day to keep her teeth clean and always sits pretty for them. As I've learned is pretty common with Dachshunds, she sleeps in the bed, under the covers, with me every night. She's also a great watchdog. The only time she barks is when she hears something outside she wants to let me know about, or when we're playing fetch. I can never seem to throw the toy again fast enough. haha Above all, she is oh so sweet and the most important part of my life. She LOVES the Dachshund video set to Don't Stop Me Now. Sorry for the long e-mail, but believe me, that's the short version of my little girl's story. Thank you so much for your blog. I've been able to find some great things for my girl here, keep up on what's happening in the Dachshund world, and find plenty of places to throw a few bucks and help out. I'm also very very very happy that Joey was able to make a good recovery. When things were kind of touch and go, believe me I felt your pain. The thought of having to see my baby in pain and the thoughts that would go through your head at a time like that... I honestly don't know what I would do. I've started a routine where I'll be taking Eva to the clinic once a month just to get a check-up and try to be as far ahead of any health problems she may encounter as possible. Prior to reading about Joey's ordeal I figured I would take her the once or twice a year I take myself to my doctor to get checked out. I probably need to start taking better care of myself too. Any old way, thank you both Joey and Maggie. I religiously read the blog and I'm a huge fan. Whimiscal, stylish, sophisticated...these are some of the words to describe Colorado-based sculptor Laurel Peterson Gregory's work. Bump, seen here, is one of many limited edition Dachshund bronzes available at the artist's website. Quacker and 'Ziggy' sharing a tender moment during their play time. Quack and [another duck] Quacker were raised in a trailer park, so they know how to stand up for themselves pretty well. Thanks to our good friend Doxieone for sending in the link to this photo; she notes that it has only been around since October 1st, but already has had 18,000 views on flickr! See more fun photos of this playful duo at Yer Photo Xpression's photostream. 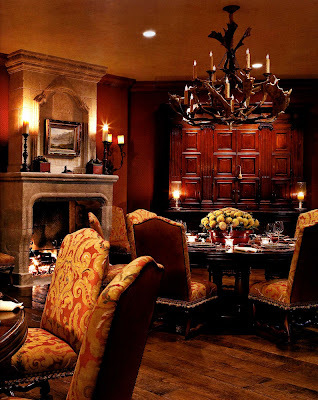 While perusing through the pages of the November, 2010 issue of Architectural Digest, we spotted distinguished red smooth piebald 'Tommy' sharing an inside view of his newly expanded guest lodge at Mesa Vista Ranch in Texas, USA. 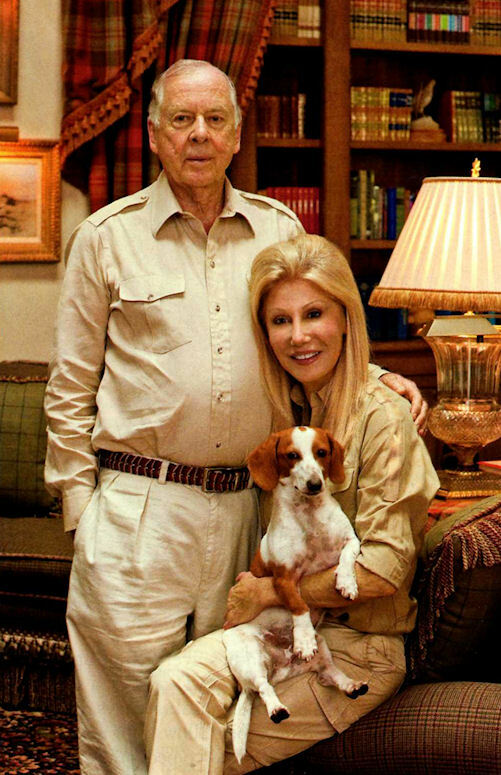 Tommy's humans are oil legend T. Boone Pickens, and his wife Madeleine. With an estimated current net worth of about $1.4 billion, Mr. Pickens is ranked by Forbes as the 290th-richest person in America. That's a lot of kibble. Designer John Cottrell decorated the Pickens' lodge. 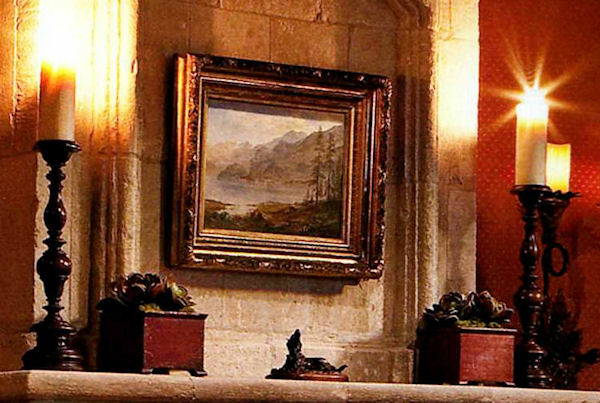 Albert Bierstadt's Landscape with Lake hangs over the 17th-century French fireplace in the new dining room. And wait....., what's that centerpiece on the mantel? 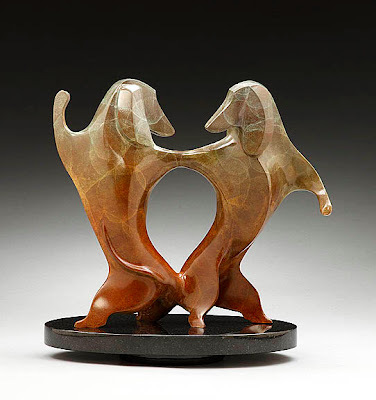 That's what we thought - a fine bronze Dachshund sculpture - good taste, indeed. Pick up the November issue of Architectural Digest (with Rob Lowe on the cover) to see more of the Pickens' guest lodge. Photo circa 1954, source unknown. 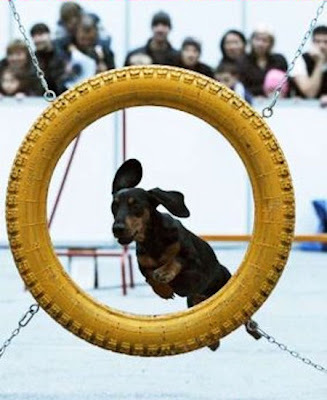 Gauis Rocks: Expert Trick Dachshund - Amazing Video! First off, it's so great to hear that Joey is feeling better, he was in our thoughts. Secondly, I have some dachshund news for you! Kyra Sundance world-acclaimed Stunt Dog Show performer, celebrity dog trainer, and internationally bestselling author has created a first of its kind, wonderful program of trick dog titles. As your dog learns tricks at different skill levels you earn titles. Well Gauis Baltar (Our little dapple puppy from Play?) has not only become the first Dachshund ever to earn a trick title, but he's has gone all the way to expert, the highest level! Here is the montage of all the tricks he had to learn to earn his title. It includes such tricks as 'get me a drink out of the fridge.' 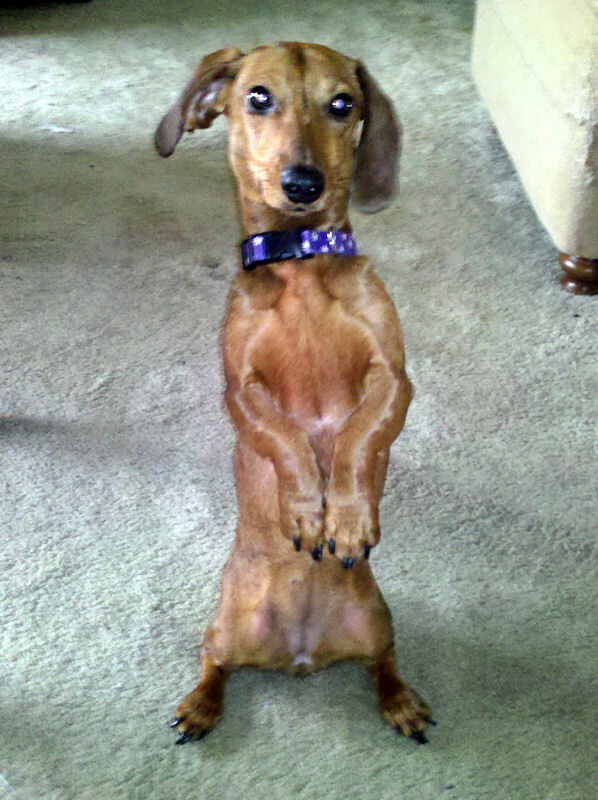 Gauis is representing for Dachshund kind, and showing that Doxies can do anything big dogs can do! 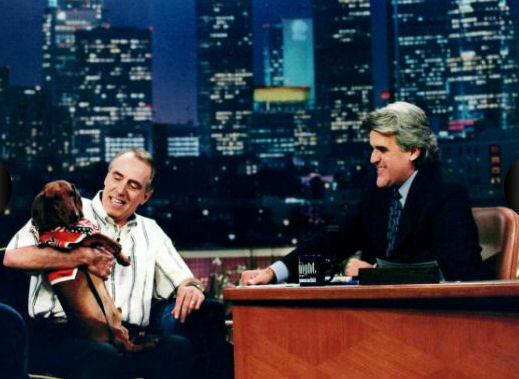 Baron, a mahogany, standard dachshund who made numerous television appearances during his racing career – including two on "The Tonight Show with Jay Leno" – died at home last week. Even with winning the 1997 Wiener Nationals, 1998 Champion of Champions, and 1999 Ultimate Challenge at the Los Alamitos Race Course, Rowland said he will remember his dog's greatest accomplishment as being a wonderful pet and companion. Ron Rowland and his wife, Betty, bought Baron from a Northern California breeder when he was 14 weeks old. The Placentia couple didn't intend to race Baron when they bought him, but quickly realized their dog had the gift of speed. 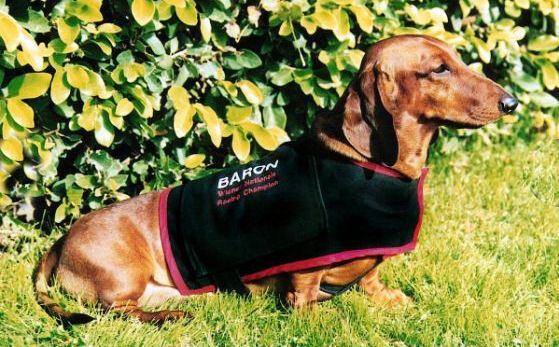 Weighing in at 35 pounds, Baron trained at Champion's Park in Placentia and the Yorba Linda Community Center. 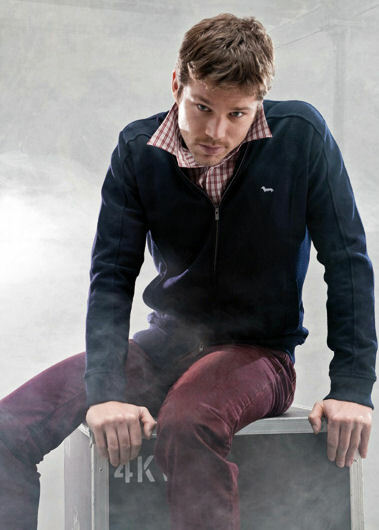 Baron was featured on numerous television programs during his career. His last major appearance was in the 2008 documentary "Wiener Takes All." Read more and see lots of photos of this Wiener Champ at the OC Register. Watch him run at his official website. 'The tremendous heart and courage Baron displayed throughout his life not only helped him win races, but also helped him tackle his later years with grace and dignity,' his owner, Ron Rowland wrote. I love reading your blog! It's my go-to website for a smile. I love reading stories of Dachshunds from all over. I thought you might like the attached photos I took at my local mall. 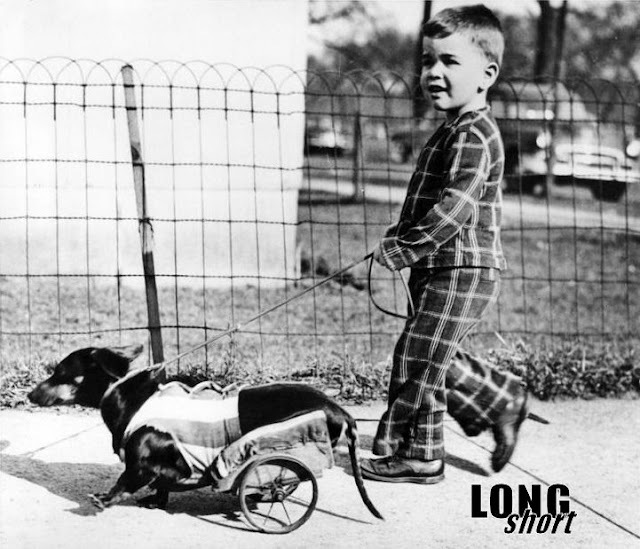 It's always good to dress fashionably, and I'm sure you'll agree - you'll be a big winner with a coordinated Doxie at your side! My black and tan Oscar sends some puppy love to you both. We're hoping you guys feel better soon! While our Dad was off galavanting around on a business trip last week, we had a great time staying with our pals Sampson, Tommy Lee, and Gina Marie. 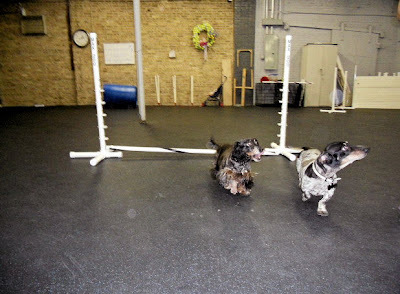 We even got to go practice some agility runs! Chasing handfuls of treats through an obstacle course? Sign us up. These aren't the best photos in the world, but you get the general idea. Maggie is doing well after starting on trilostane for her Cushing's disease last Sunday. She has already started to drink less water, and has had no notable side effects from the medication. She will have her cortisol levels checked at the vets some time this week. No Joey, you're supposed to jump OVER the bar, not go around it. 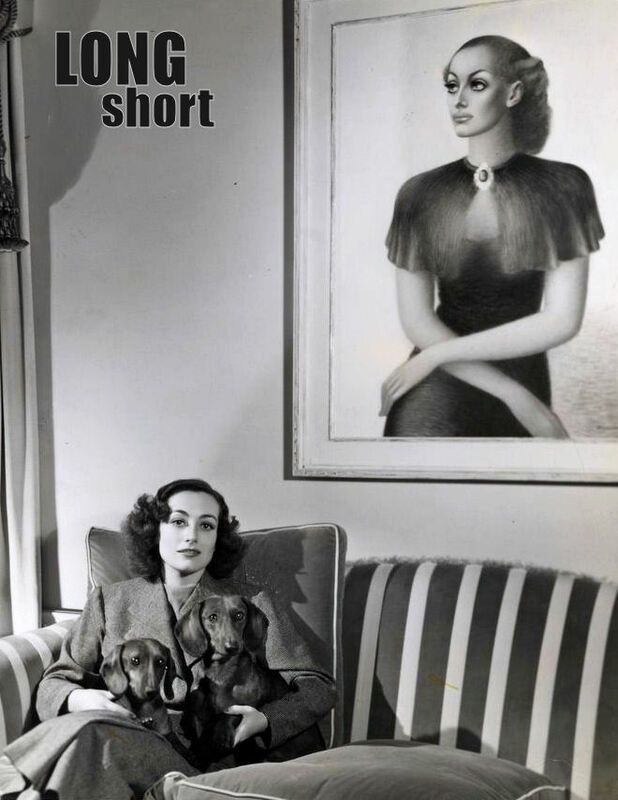 We're going on vacation, but we'll be back in a few days with more breaking Dachshund news, pop culture, vintage fun, awesome reader features and great videos. 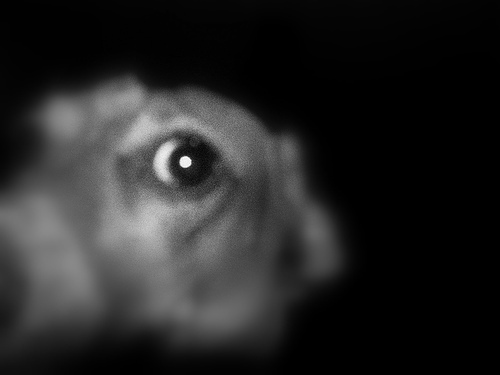 Speaking of great Dachshund videos, you won't want to miss the return of 'Gauis' in the follow-up video to his smash hit Play? Stay tuned! On the home front, we've got some great news! Well, it's bad news which could be much, much worse, so we'll call it great news! If you remember in one of the first posts about Joey and his Cushing's disease, we stated that Maggie had some unresolved issues as well - drinking a lot, pot-bellied appearance, etc, like Joey, but Joey's off-the-charts liver values led us to start surgery on him right away. It turns out that after a urine specific gravity test, urine cortisol test, ACTH stimulation test, and Ultrasound, that Maggie does indeed have Cushing's disease as well, just like her littermate brother. That's the bad news. However, the great news is that she does NOT have tumors on her adrenal glands the way Joey did, so her Cushing's is pituitary dependent, and surgery is NOT required for her. Even our vet said that he wouldn't be surprised if Maggie had the adrenal tumors like Joey since they were littermates. Honestly, Joey's vet bills were so astronomically insane - like the price of a brand new mid-size car - that we had no idea where the money was going to come from if Maggie needed to have surgery. It is such a relief to know that she can be treated with medications instead of surgery - you have no idea. The guilt of being able to provide surgery for one dog and not the other was too much to handle. But she is starting on trilostane to treat her Cushing's disease today - the sweet little girl. Hoping all goes well. 2010 has been quite the year for us. So, we'll be back soon, and give your furry friends a BIG GIANT HUG. In the meantime, enjoy the archives, and also we've got something really special for you if you haven't already seen it - our dear friends at Dachshund Delights have penned a beautiful poem in honor of Joey and his trials this year. Don't miss it over at Dachshund Delights in their Newsletter Feature of the Month. In September I helped my partner move to Portland, Oregon for school. Unless he is a very good actor, I believe I've inculcated in him my Dachshund Love. One day he began screaming at his computer and after four "What's going on! 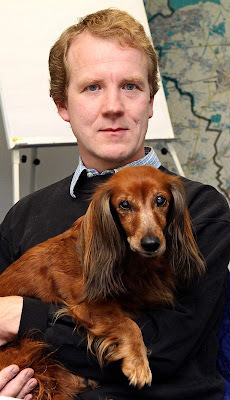 "'s, he showed me the page he'd found announcing the Wiener Dog Races in Oaks Park. We're not really Octoberfesting people but we had to go, so after a long public transit trip which included missing a bus stop and calling a taxi in the middle of nowhere to get us to the races in time, we finally arrived. As soon as we entered, we paid our entrance fee and got stamped......Doxie stamped. 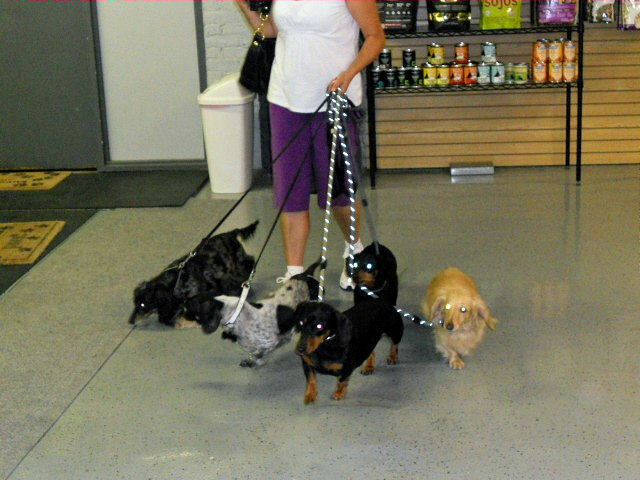 Looks like your partner has officially been stamped a Dachshund Lover! 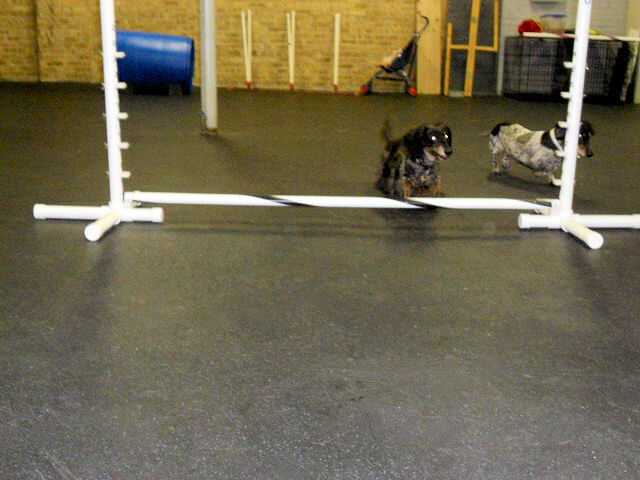 After a bit more training, we're quite sure that he will in no time be a full-fledged Dachshundist. Keep up the great work. And thanks for sending in the photo! It almost feels like we were there! The Dachshund Club of Santa Ana Valley (DCSAV) was the host club for the Dachshund Club of America (DCA) 2010 National Speciality September 28th - October 2nd. Congrats to the champ and all the beautiful dogs who competed. We don't want to spoil the surprise, you'll just have to watch the video to see who won Best of Breed. Via youtuber purebredstudios. Dachshund people. Are you a Dachshund person? What exactly makes people Dachshund people? Do you have to own your own Dachshund? Or just adore them? We're reminded of a time when our local meetup group was going to have a get together at a downtown art gallery. One of the employees at the gallery owned a red smooth, but she was a little nervous about going to the meetup. "Why?" our Dad asked her. "Because I don't know if I can handle being around a bunch of people running around in sweatshirts with Dachshunds on them," she said. 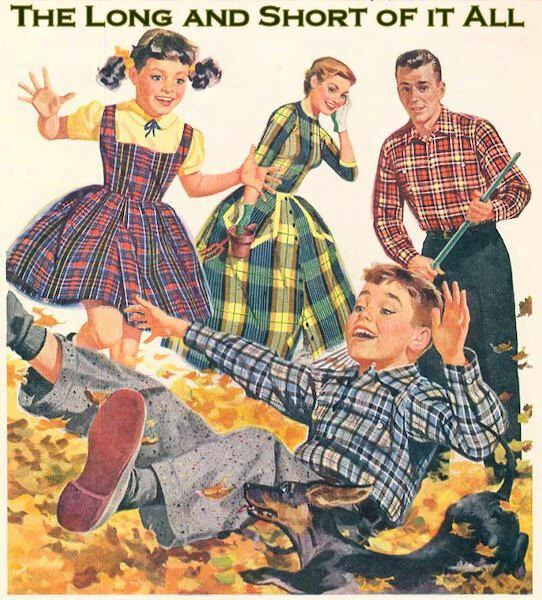 "Oh, come on," Dad said, "you'll have a great time." Sure enough, she decided to come, and yes.....there were plenty of Dachshund sweatshirts, t-shirts, hats, dogs in outfits, wiener dog shaped cookies....Dachshunddom was all there, in all its glory, basking in a ray of Dachshund pride. After the event, Dad went up to the girl and asked "So, what did you think?" She replied with a smile on her face, "When's the next meetup?" 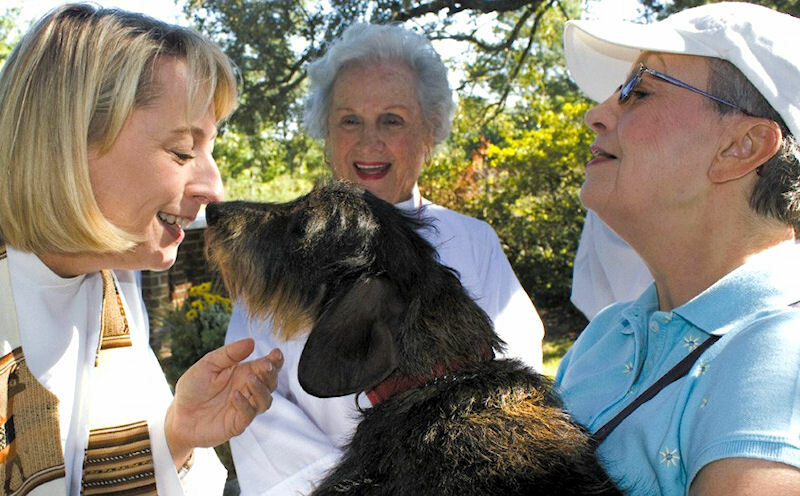 Peggy Glaister (right) and her wire-haired Dachshund, 'Schatzi,' receive blessings from Rector Christiana Olsen on Saturday at St. Francis of Assisi Episcopal Church in Gulf Breeze, Florida. Source: Gulf Breeze News. Those Special Dachshunds: Meet Chili! Three years ago, Chili came into Dachshund Rescue of North America foster care grossly overweight and with a series of other issues. I volunteer with DRNA and ended up adopting Chili after fostering him for a few months. About 6 months later, a disc in his back ruptured and I was told he would never walk again. Together, Chili and I worked hard and on his post-op exercises to prove the probability wrong. The recovery was intense, but with the help of so many people in the NYC community (including his daycare, Paws in Chelsea, to his incredible veterinarians at West Chelsea Animal Hospital) he began to move those little legs!2 Years later, Chili is now up and RUNNING on all fours. He is a true inspiration to all handicapped dogs and their owners. I NEVER gave up on him and in turn, he only gets stronger every day. Fashion photographer Justin Clynes took these photos of Chili and me on his 9th birthday to celebrate Chili’s great journey and the bond between us. 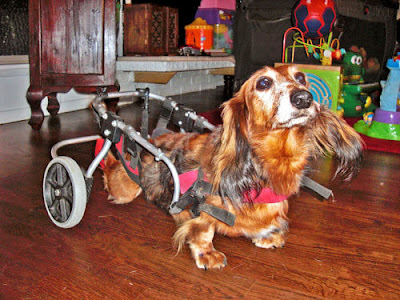 We're so glad to hear that Chili is doing so great after his bout with IVDD. Hope he had a well-deserved grand birthday celebration. Joey can't stand it anymore. Woof, WOOF, WOOF!!! If only for Chili's inspirational tale! Who? Zac Posen is an American fashion designer. 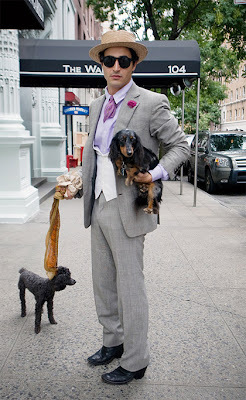 According to PupStyle, he was recently spotted on the streets of New York with a poodle and his longhair dappled black and tan Dachshund. High style, indeed! The article goes on to note how fashionable it is to tie a scarf to your leash, but they are withholding any comments on his "man-heels." Thanks so much to Jean Siska, human to 'Fiona' and 'Max' for writing in with the link and photos. 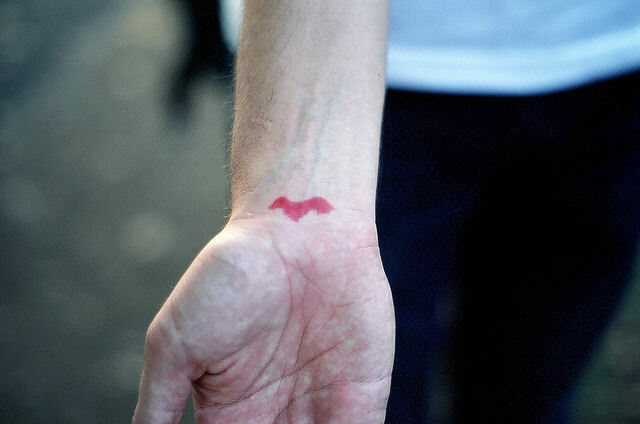 Guys - wear your heart on your sleeve and make sure to put something from Harmont & Blaine, the only menswear that matters, on your holiday wish list. Spot the Dachshunds in these images from the fall/winter 2010 photo shoot. 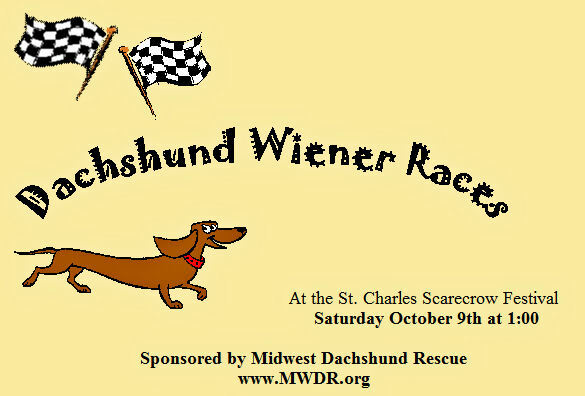 If you live in the Midwest, you don't want to miss the Wiener Races which are a part of the Scarecrow Festival in beautiful downtown St. Charles, Illinois, THIS Saturday. The huge festival is celebrating it's 25th year and features a downtown park full of handcrafted whimsical scarecrows on display competing for prizes. Bring the kids to the carnival, petting zoo, live entertainment and craft show. Wiener Wannabees for Dachshund mixes or small dogs under 25 pounds. Also on Saturday at 3:00 Petco will hold a Puppy Pageant and Parade for all breeds. 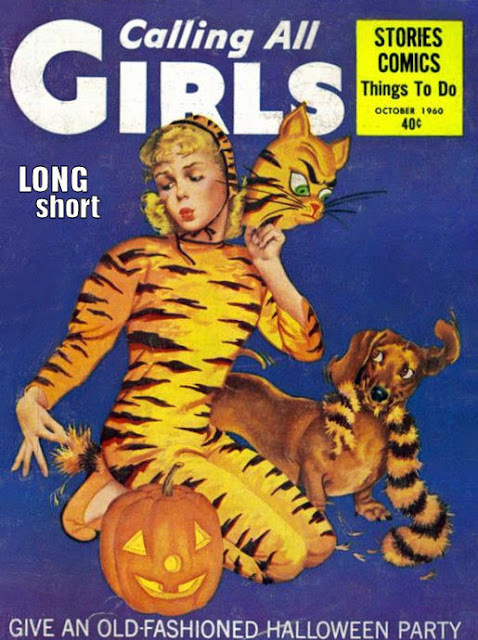 There are 3 categories for this event: Best Four Legged Scarecrow, Best Halloween Costume, and "I don't like to dress up, but I can do tricks." So come out and visit with us, enter the contests, and plan to make a day of it! Location: First Street in downtown St. Charles, on the large grassy area across from the parking garage. Pick up maps and schedule of events all over town that weekend or visit http://www.scarecrowfest.com/index.php to download. 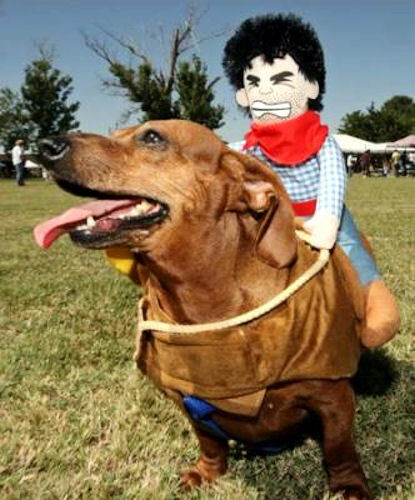 8-year-old 'Willy' carried a Cowboy doll on a saddle Saturday at the 3rd Annual Dachshund Stampede at St. Luke Episcopal Church in La Union, New Mexico, just west of Canutillo, Texas. Gift bags were given to the first, second and third place winners. The first Dachshund races started at the church five years ago when the dogs ran through enclosed chutes, said Rev. Jeff Lambert. The dogs now run in an open field with their handlers. Willy was an attention-getting spectator rather than a racer at the event. Read all about the Dachshund Stampede and see a few nice pics at the El Paso Times. the 2010 WIENER DOG RACES on Oct. 2nd at Morrell Park on River Street in downtown Savannah, Georgia. The annual event during Oktoberfest benefited local pet assistance charities and attracted about 150 Dachshunds and their owners to Morrell Park in downtown Savannah. Congrats to 'Frankie' for taking the crown this year, as well as 'Molly' and 'Sadie' for taking second and third place respectively. Read all about the event and see lots of photos at Savannah Now. I don't know if you remember us, but last winter we sent you a copy of a picture my goofy daughter made for a school science project, she had drawn some amusing pictures of our little mischief-making Dachshund puppy, Cooper, in it. Cooper just recently turned one year old, and yesterday we took him to the Savannah Wiener Dog Race! I put some pictures from Cooper's heat up on Flickr and thought I'd pass the link along. He cracked us up by not really leaving the starting area, which was about what we expected. But all in good fun and we had a great time! p.s. Joey, we're so glad to see you doing well now! And of course we remember the Dachshund Science Project Drawing, we still haven't stopped laughing. Glad to hear it was a great time. Wish it wasn't so far from Chicago!